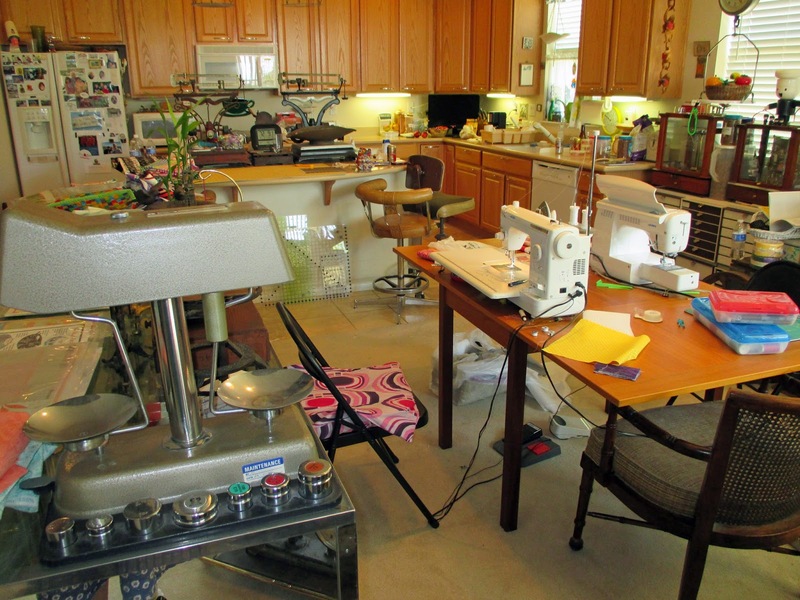 Now for the 3 and a half week sewing retreat that any sewer would give up almost anything for. Carolyn and I went to California last September to cat and house sit while my dad drove to the east coast. This time he drove to Florida for a scale convention, then went all the way to Connecticut to see my sister with plenty of visits on his drive up. Did I tell you about my dads scale collection? More on that later. My car was so heavy because it was filled with so much sewing stuff I could feel the difference driving over the passes. A person doesn't want to get bored with only a project or two at hand. Yes, I was the one with too many projects. 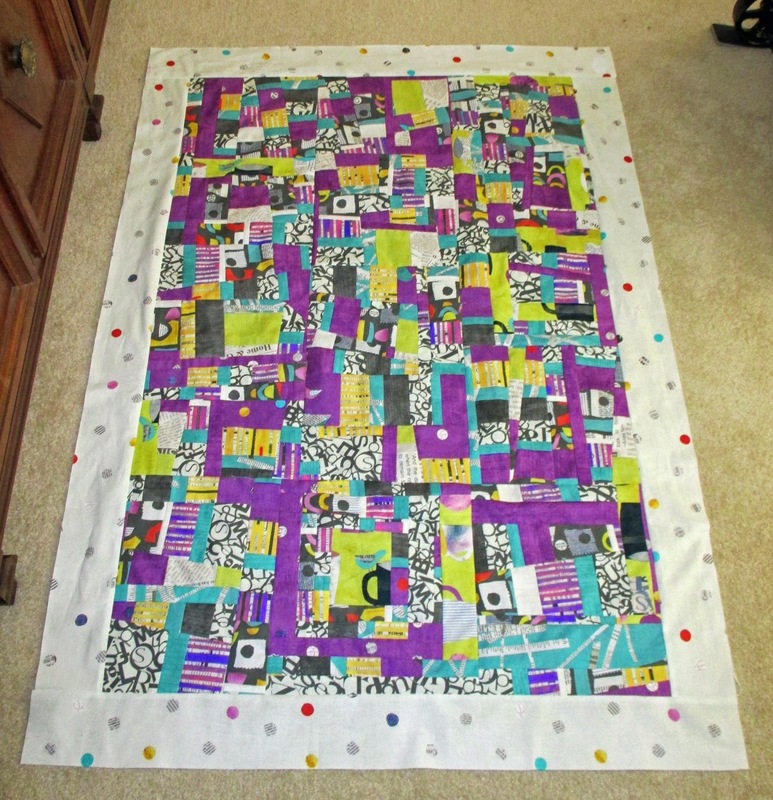 I absolutely love this fabric, so I took it along with great ideas floating around in my head. The problem was I didn't like my first or second idea. 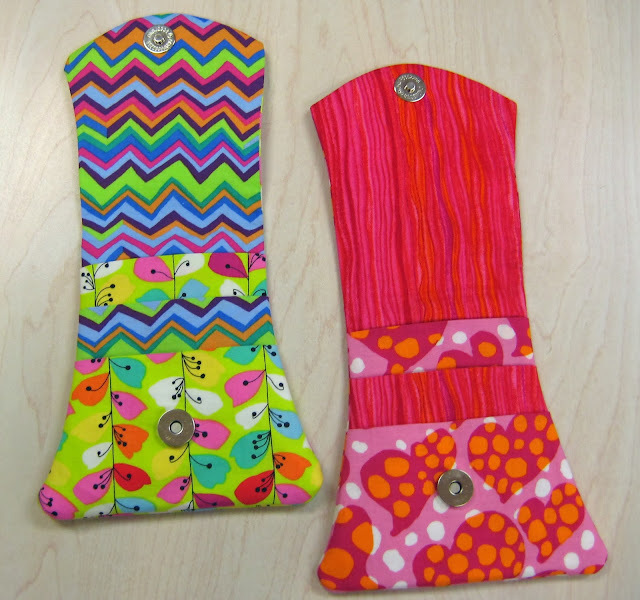 I ended up sewing and cutting and sewing and cutting. I do love the end results. This was the first four days. 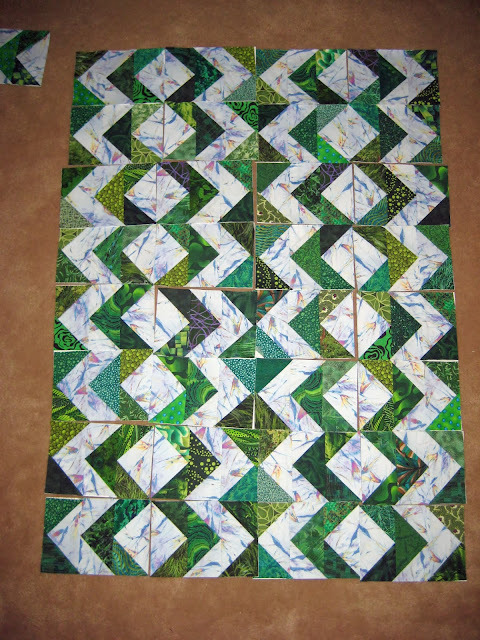 I will take a better picture after I quilt it. Yes, I will be doing it myself as it is somewhat bigger than a baby size. I have no idea what size it is! Notice our wonderful cutting area at the bar. This must have been in the beginning of our trip as the area is too clean and organized. Did I mention my Dad collects scales? There are a few around. That is his passion like sewing is mine. And you wondered where I got my hording tendencies! My sister came for a visit in the middle of our stay so I made her and my niece project bags. 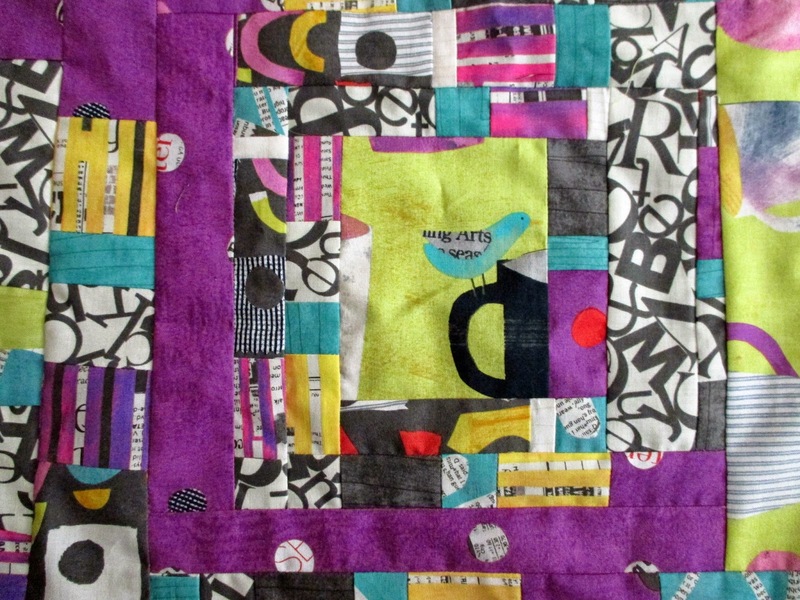 The birds are part of the Collage fabrics and the yellow one is an old Jane Sassman fabric. 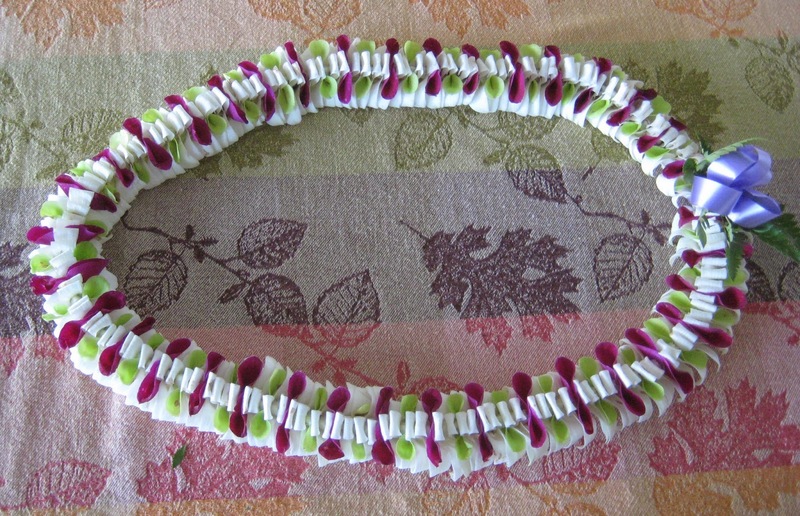 My niece crochets so maybe she will use it for her projects. They are about 15" square. 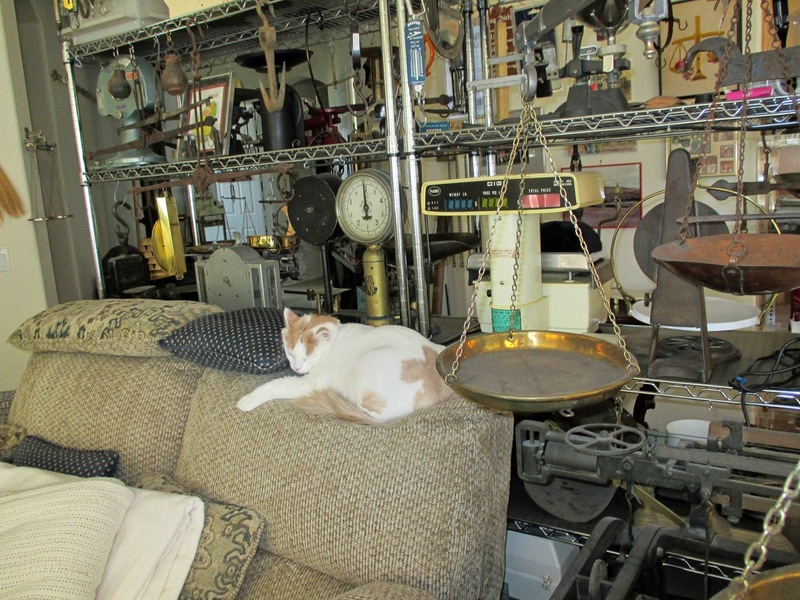 Did I mention Dad's scale collection? 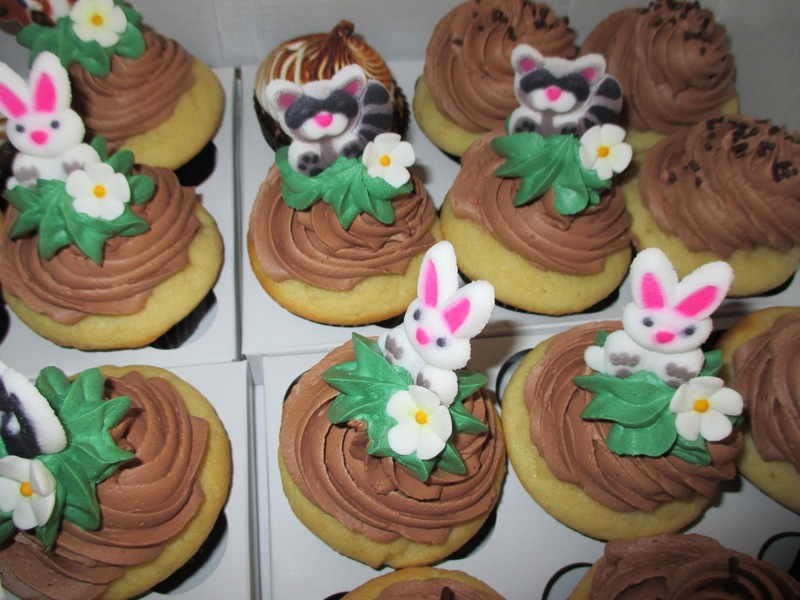 Here are a few more! And Sammy, asleep again. Carolyn bought one of the big blue yo-yo makers and I had to try it out. The addiction started again! 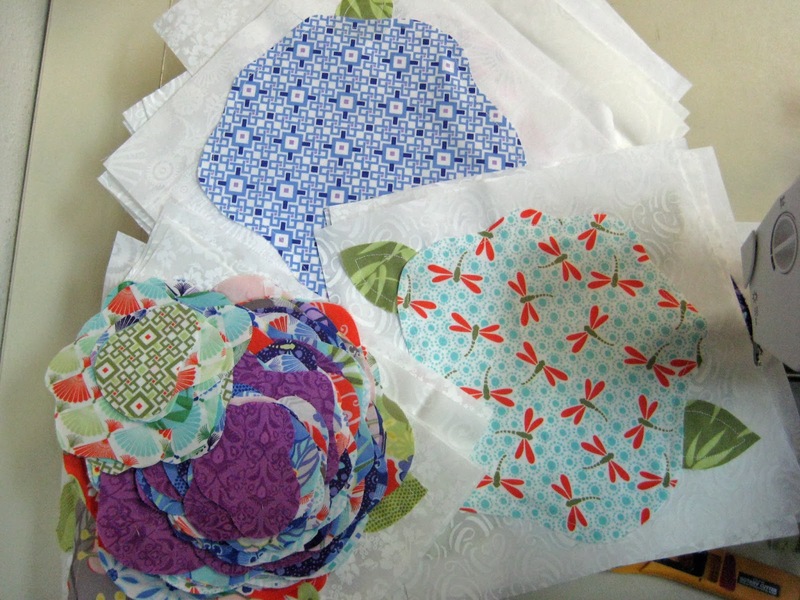 I had brought the fabrics I wanted to use in my project from home so I was ready for some night time hand sewing. 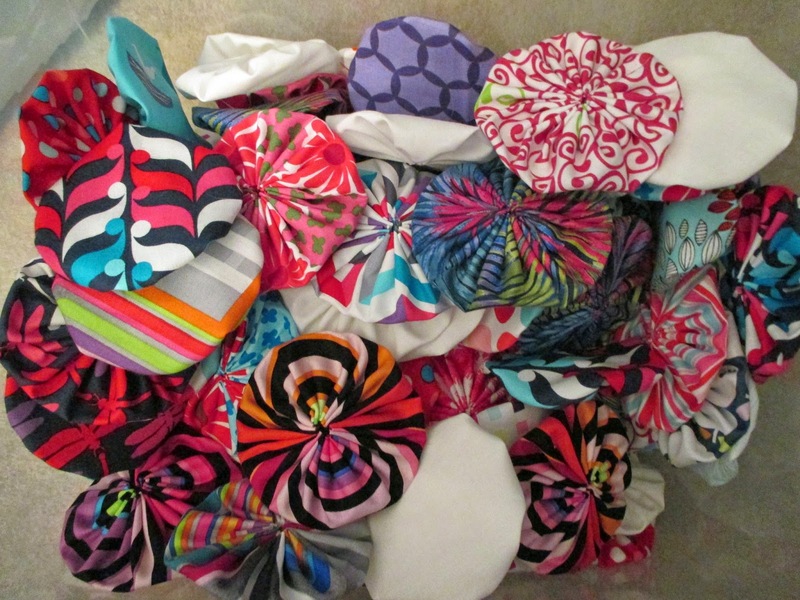 You can only get 16 of these babies out of one yard of fabric. I used 9" squares so I wouldn't have to fuss with them too much. 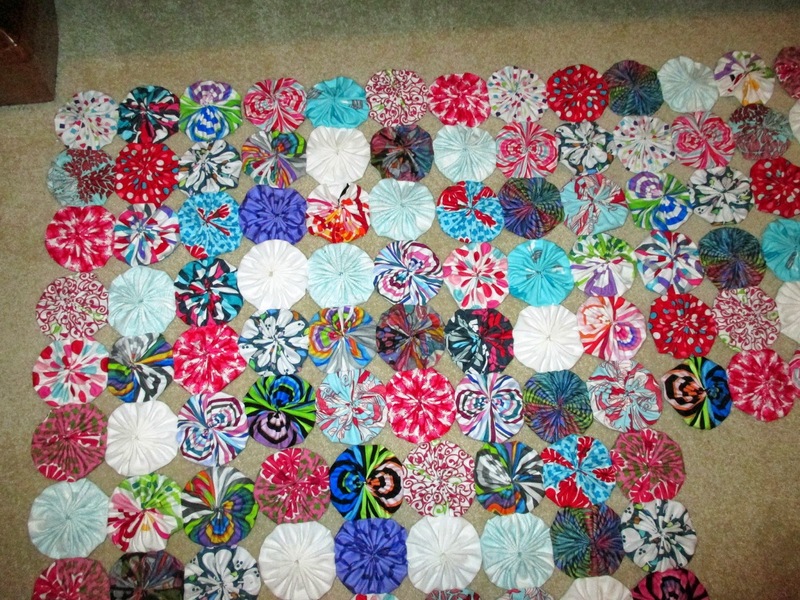 I am sewing together 9 yo-yo's and it makes a 10" square. I will do 7 sections across and maybe 8 down. I need 504 and I am half way there! Making the yo-yo's that is. 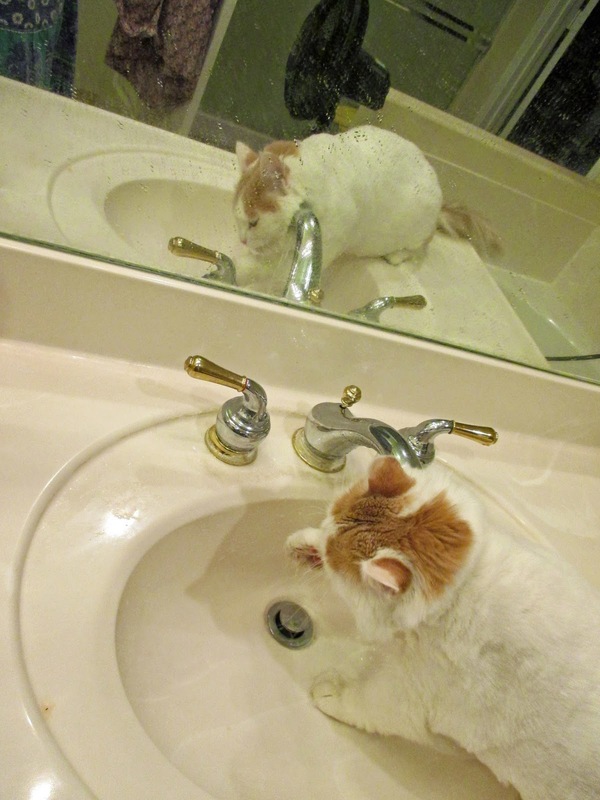 One last picture of Miss Sammy taking her bath and drinking water before bed. I do miss her but she is glad to have her daddy home again. We were barely able to get all our stuff in the car for the trip home. We did go on a couple of F.A.R.T. 's (fabric acquisition road trips). Maybe that's why... It was a great time. Thanks Carolyn. I have been on a few great adventures since I posted last. I lost my camera so I had to wait until I got a new one. I went to Colorado the beginning of April to visit the kids, my grand dog and grand kitties. 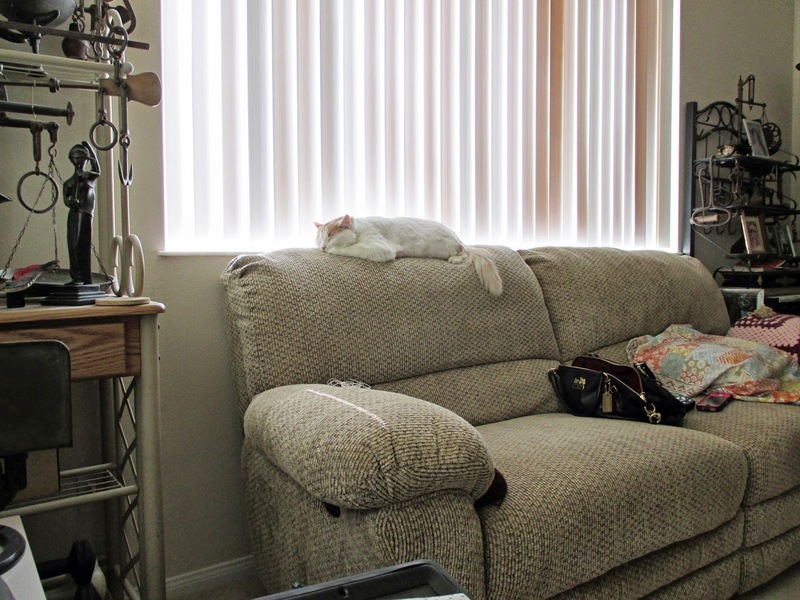 The kitties aren't around much when Vesper is in the community area. 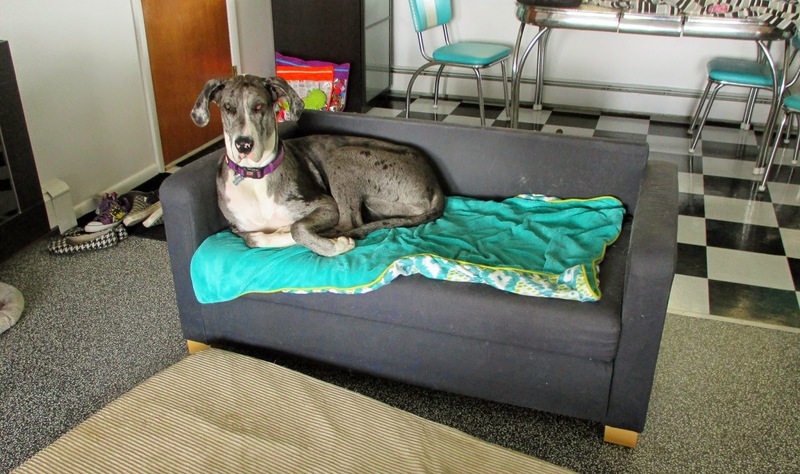 Vesper is so big she has her own couch! 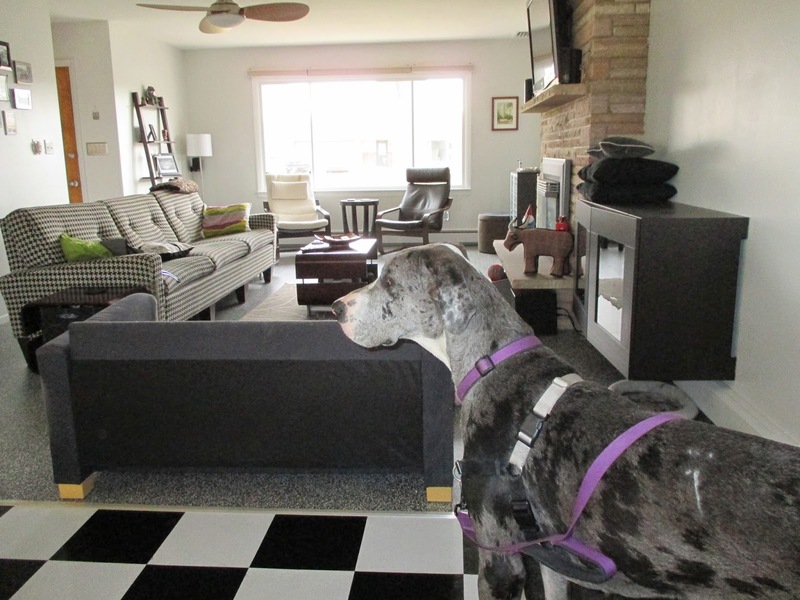 At 120 pounds I don't think she has reached her full potential. Love moms choice for her blanket. I tasted my first Irish Car Bomb drink on that trip. It was so tasty I got the recipe just in case I wanted that same yummy feeling in my tummy in my future! In case you want to give it a try, pour 1/2 pint Guinness in a pint glass. 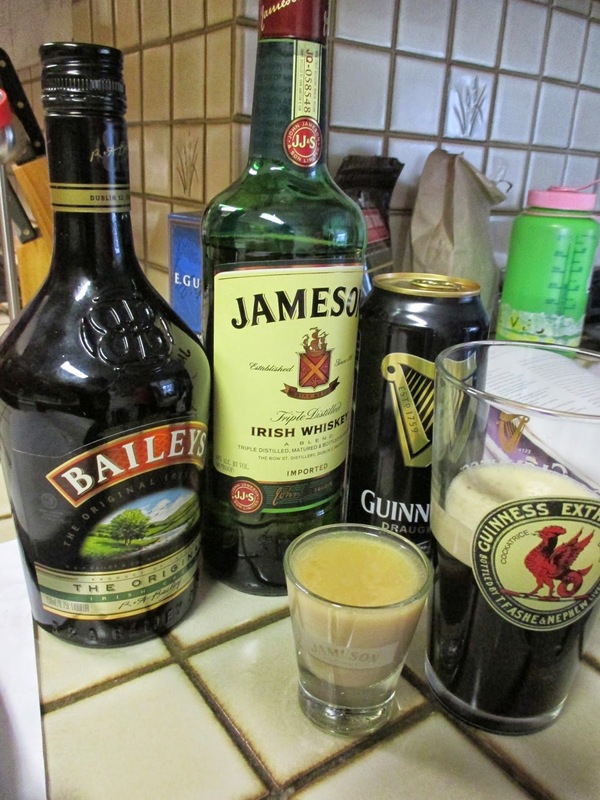 Fill your shot glass half with Baileys and half with Jameson Irish Whiskey. I don't like whiskey but I liked all the rest so I trusted my son and DIL not to lead me down a dark and tasteless path. Next, tilt your glass and slowly slide your shot glass inside. Now, without stopping, chug the entire drink being careful not to bang the shot glass on your nose as you drain the glass. Sit back and enjoy the warm caramel comfort. Caution...they are mighty good so don't enjoy too many of those warm caramel comforts. I also enjoyed tasting a few of the beers at the local brewing company. I'm going with the beer for the hot summer months. I never knew there were so many tasty beers. On to other joys of that trip. 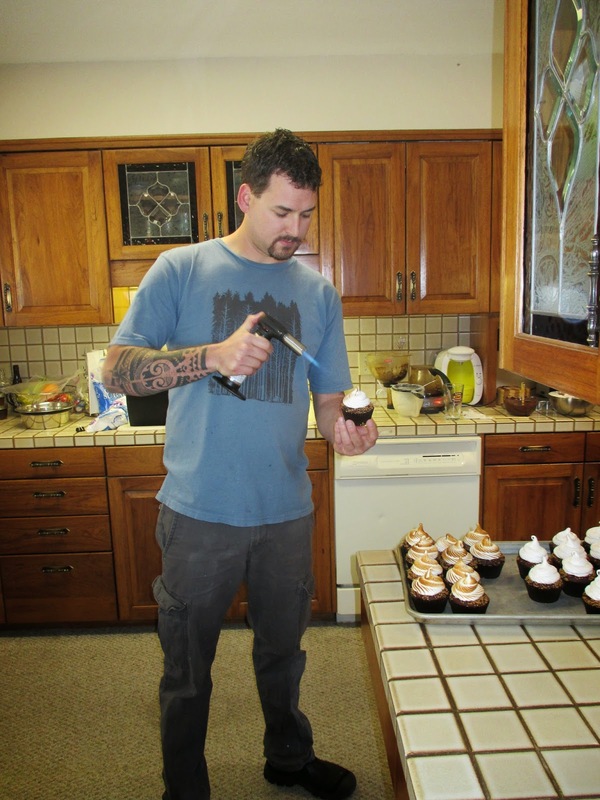 With torch in hand, Alan does his part for the baby shower cupcakes that DIL made. They tasted like s'mores too. 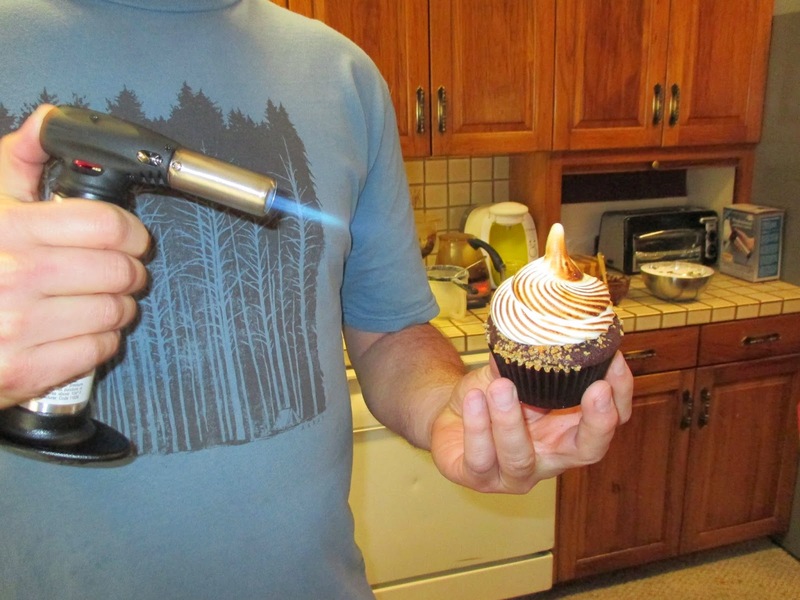 Very clever trick to know when making s'mores cupcakes. Alan just likes to play with fire! 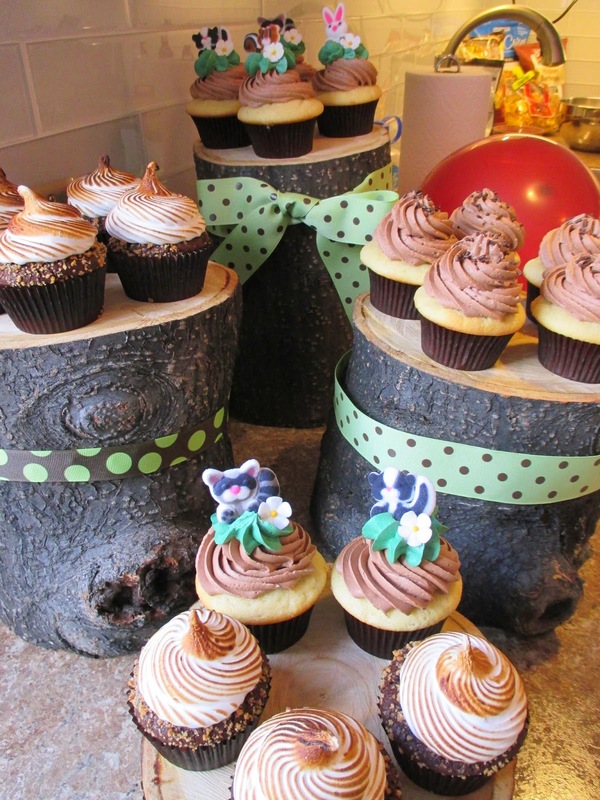 The baby shower had a woodland theme so these were perfect for the occasion. The display was ingenuous. I helped Alan cut these real tree stumps. They were still damp! 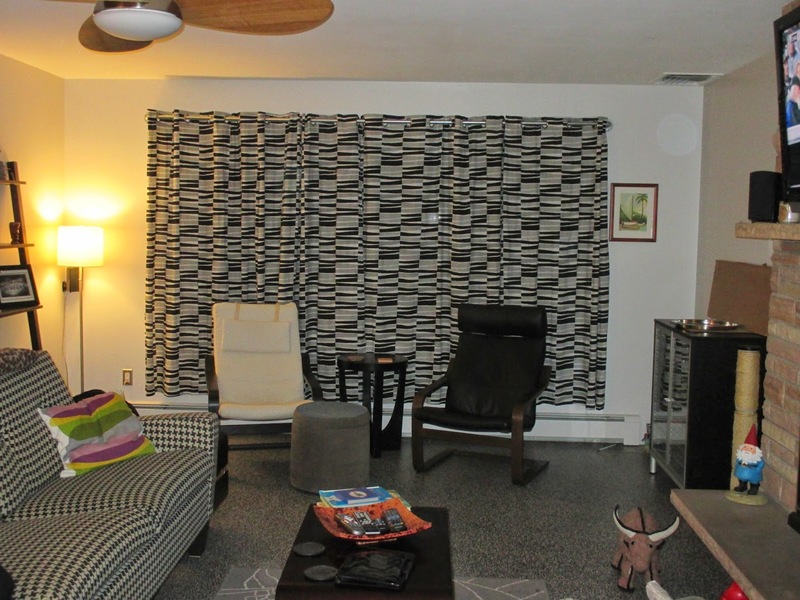 I cut and hemmed the new curtains for their living room. My DIL had a great idea to use a pipe and pipe fixtures to hang these. They look great opened or closed. Blogland says this is enough for one post! I just returned from my 3 and a half week trip to California to babysit my Dads cat and house. Remember when Carolyn and I did that in September 2013? Stay tuned! Two in one month. I'm on a roll! 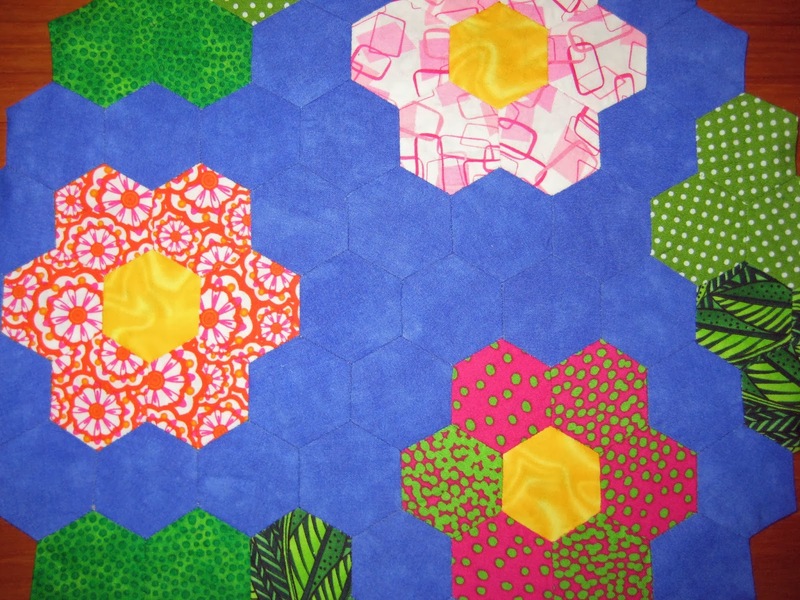 Although this one is small I am really excited about it because it is the sample for my hexie class. 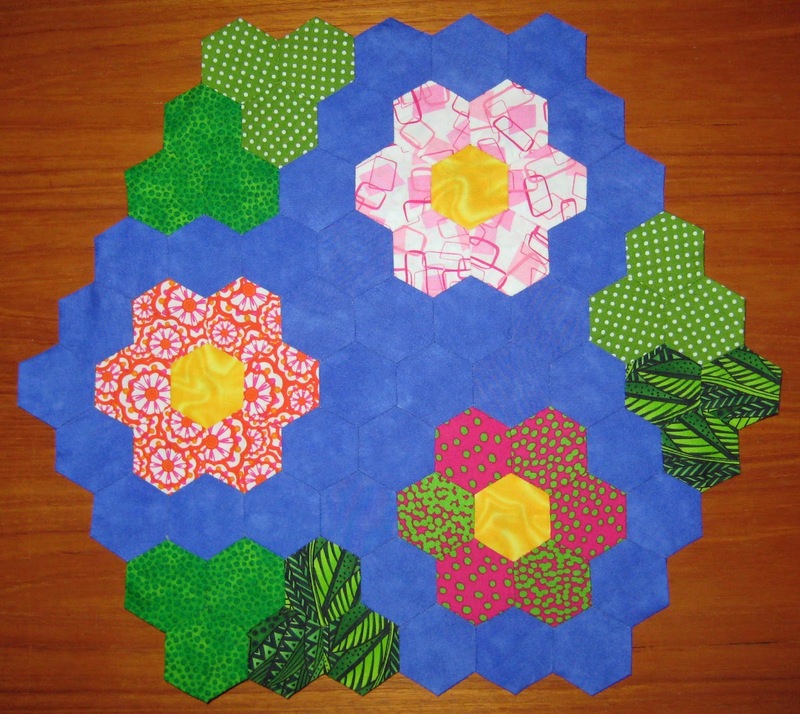 The book for my class is on back order, so until it arrives I will be making more samples to demonstrate ways to finish hexagon projects. Stay tuned. The back is finished with a fused interfacing on a blue fabric because I wanted finished edges. 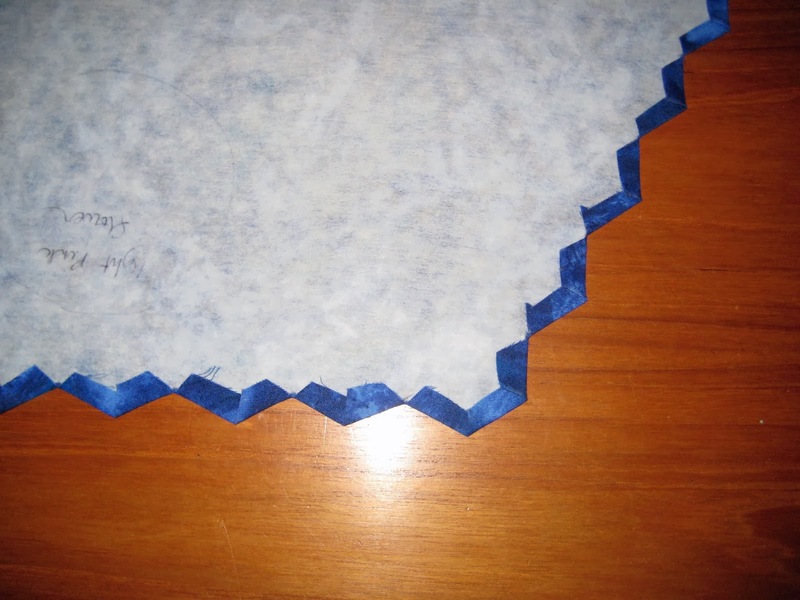 I traced the outside of the finished piece, fused the interfacing to the backing and cut all the inside points. After ironing I was ready to hand stitch the edges. Well, not so fast...it was too BIG! I had not taken the paper pieces out yet when I traced it. After removing the paper, ironing and using my Best Press I was ready to start the backing process again. It fit this time. 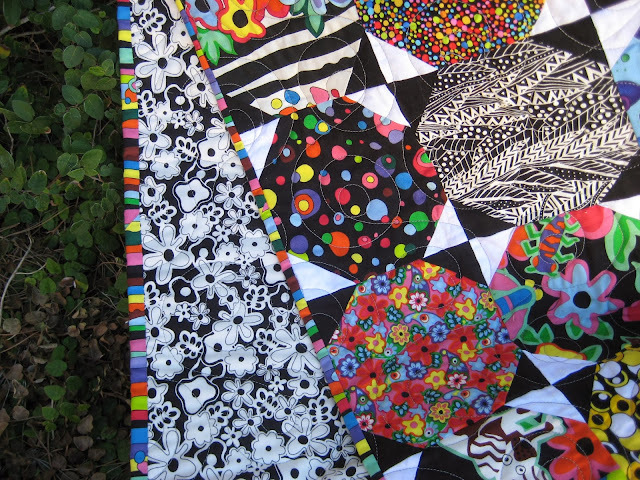 Some of you might remember this project was supposed to be a quilt but you know how things go! 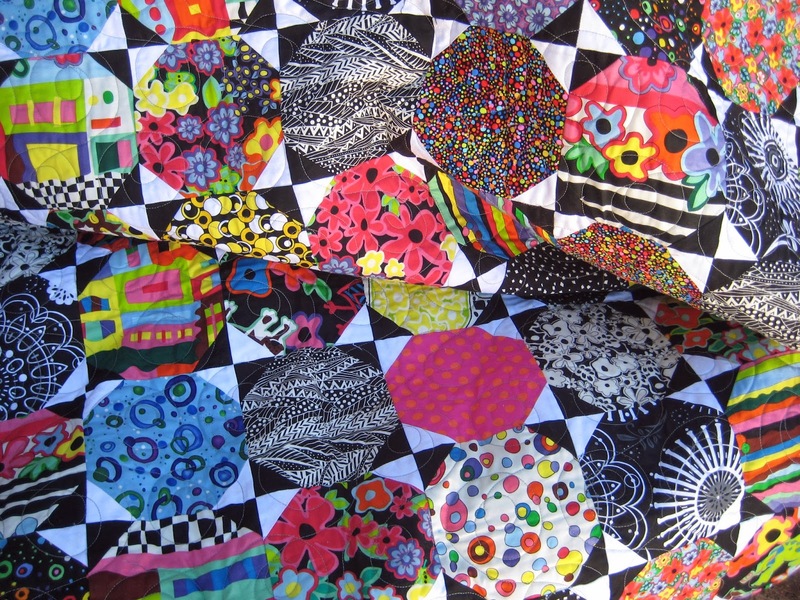 Upon further inspection of my colorful project I noticed it is not symmetrical! How can that be? The three parts of the whole were all the same but if you count the points on all sides they are not the same. All right you math people out there, how can this happen? I would like to understand this. I never make new years resolutions because I believe all "rules" are made to be broken. I have my goals at this moment to finish some of my unfinished projects. We will see how that goes as the year progresses. 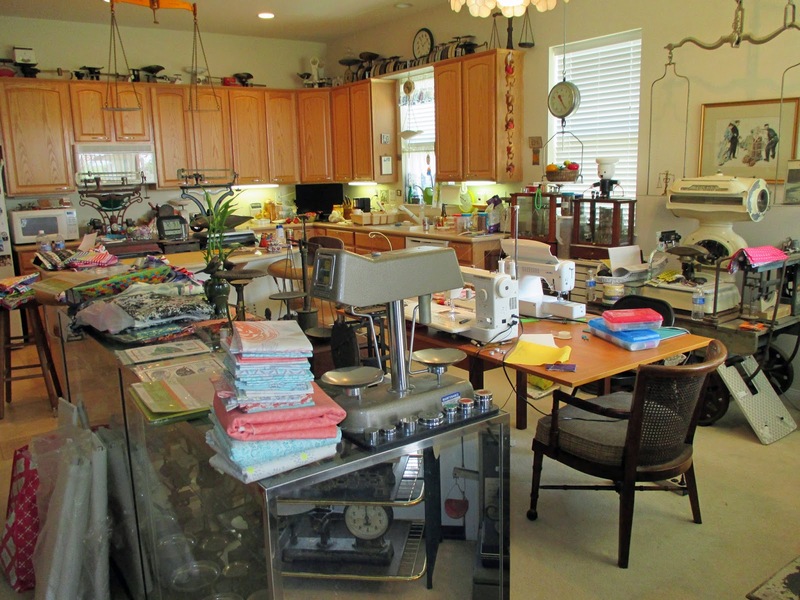 I found a Small Blog Meet at Lily's Quilts that should be fun. I love finding new bloggers and learning what they are into. 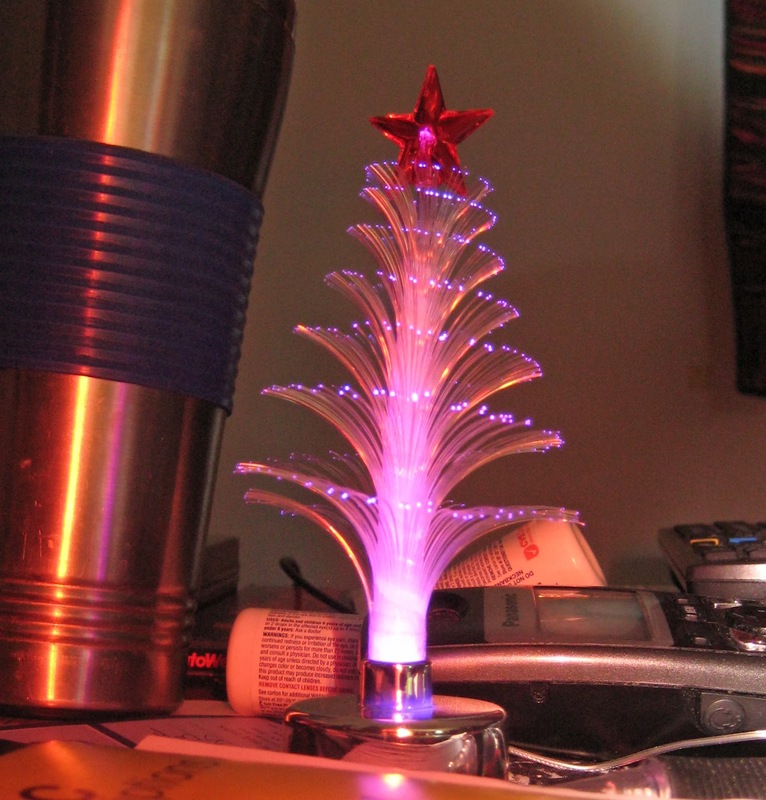 The last finished project for 2013. 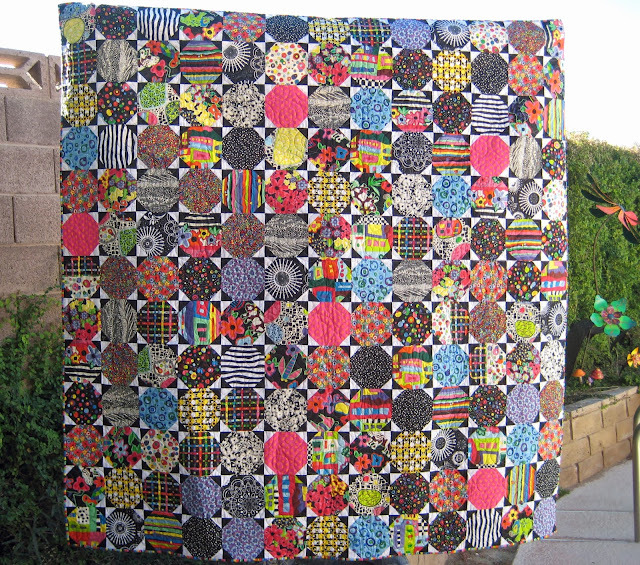 I think I started this in 2012, found it again in 2013, finished and had it quilted by Zany Quilter. She does such a wonderful job. 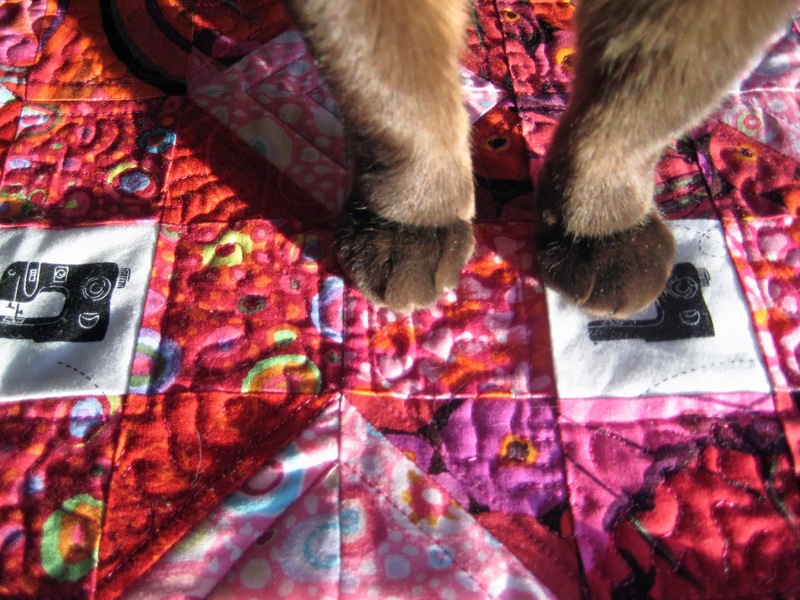 She also does a great job on her photo's of the quilting. Check it out. 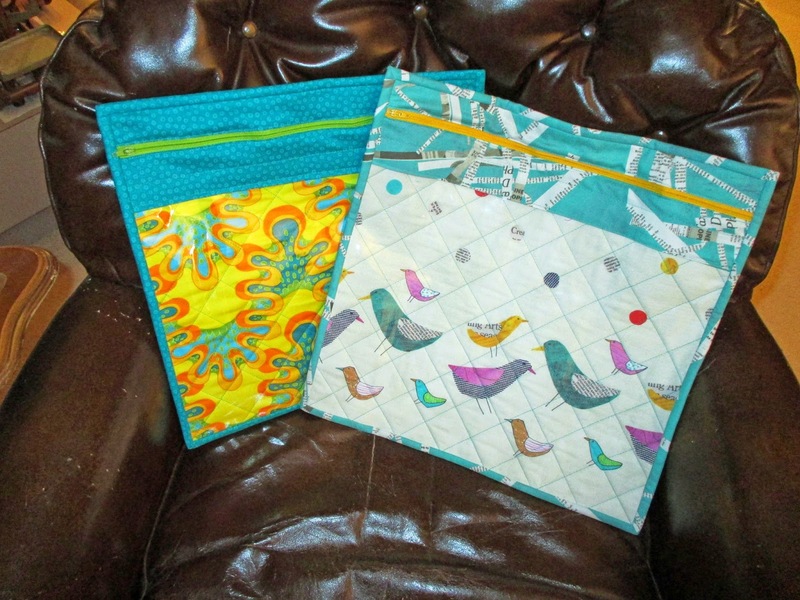 I'm supposed to be cleaning my sewing rooms but instead I did a post! Lots more fun. Complete finishes are so few and far between, I get so excited when I have one. Until next time be happy, healthy and safe. I have been having lots of fun lately. I am working a lot and I'm really enjoying it. 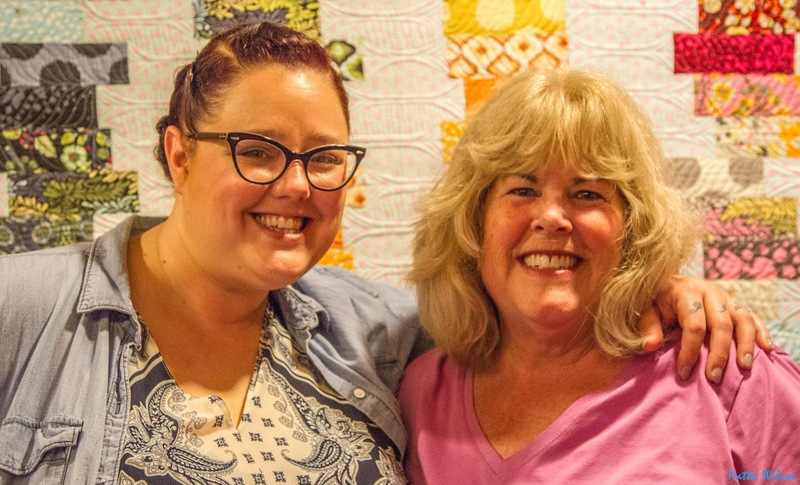 Quilters are very fun people. 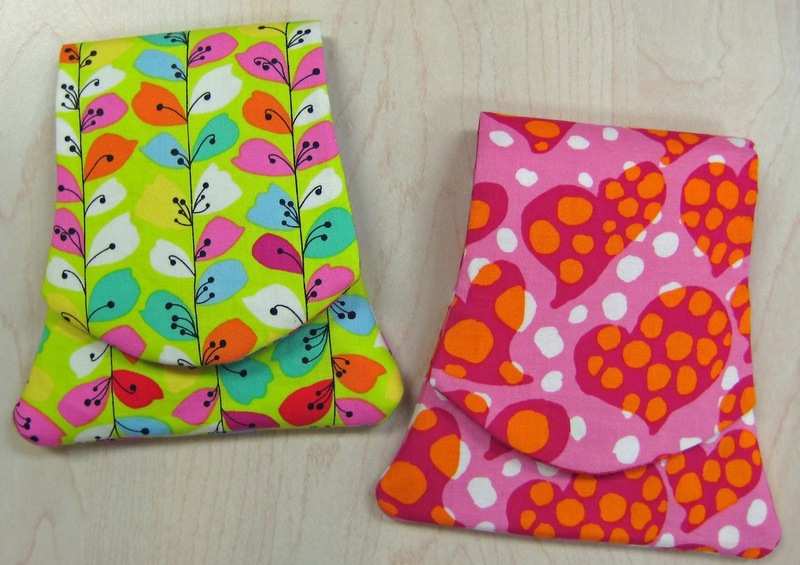 Valeri Wells Little Wallet and iPhone Wallet patterns are so easy to make. I forgot to take a photo of the back pocket for your iPhone but it's there! It is large enough for my friends phone with a large OtterBox case on it. Now that's a proper iPhone wallet. Lots of room for cash, credit card and ID. I know, I have been busy and the time is just flying by. Working, sewing, sewing, sewing I hardly have time to take pictures, type, edit and such. I know you want to know what I'm up to. I promise I will try to do better. I think I started this in 2010. I have a long way to go to finish but maybe 2014 will be the finish what you started year. 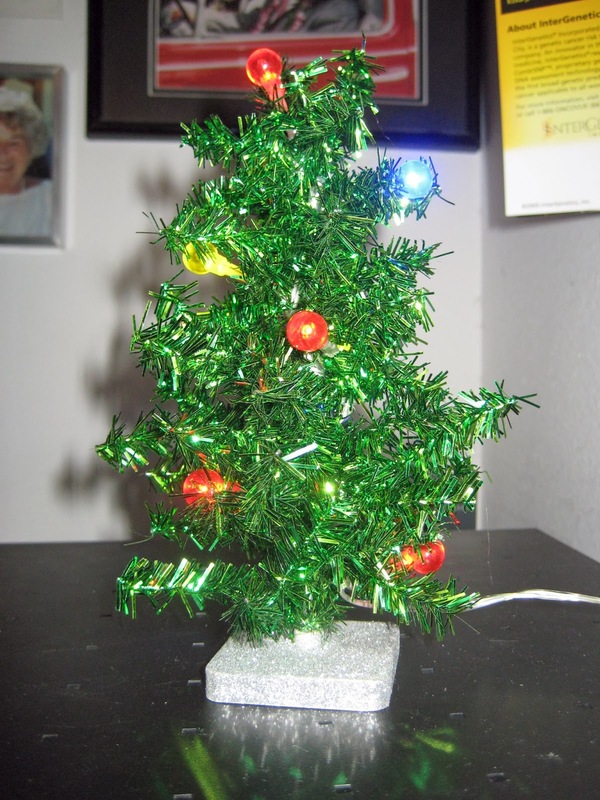 This is about all the decorating I've done so far this year. Here is the tree I gave Mike last year but he put it somewhere and can't find it. Here is another finish it up project for this year. I was looking through the photos I transferred off my SD card and came across this one of my shadow. Sparky always thinks I want to photograph him. He has such tiny feet! This is a lei given to me by a dear friend from Kauai while I was in Hawaii in October. It was so unusual I had to get a photo. I also thought it could be inspiration for a quilt design. I'll think about that. Last but not least this is something my son served us at breakfast one morning in Hawaii along with the usual fresh pineapple and papaya. He said it had a wonderful taste and texture. He was right! I have no description except it was sweet and juicy. 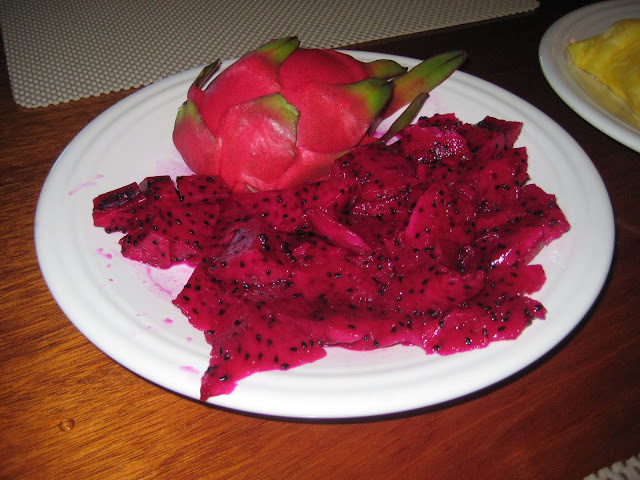 If you ever have the opportunity to eat dragon fruit, give it a try as there is nothing quite the same.